Thanks to Simon and Schuster UK for approving a review copy via Netgalley. Book lover, Darcy Archer, has the ideal job in a small independent bookstore in Manhattan. For a single girl, in her thirties, who adores classic literature and surrounds herself with books at home and work, she is quite content. Her dreams are set in the world of Jane Austen and the Bronte Sisters. She has a tiny apartment, regularly meets us with her aunt, who raised her after her parents death, and enjoys her daily bike ride through the busy streets of the city. That is, until she runs over a man out walking his dog, and things get a little bizzare. The man, unconscious, is rushed off in an ambulance but Darcy is left with his rather large dog and no idea how to reunite them. There is also a beautifully wrapped gift left at the scene of the accident and she feels obliged to make sure the present also makes it to its intended owner. She begins a the unusual manhunt and, with some help from her fellow booksellers, she finds Aidan. Happy ever after, right? Actually, no. There is a small problem. Other than his name, Aidan has no memory of his life before the collision. Trapped in the hospital, it is left to Darcy to try and figure out who Aidan is, and why no one seems to be looking for him? This novel is set in the snowy December period that lends to some beautiful descriptions of Manhattan, and all its glories, under the crisp frost, ice and snow. Christmas shoppers are out in force and the atmosphere is positively dreamy. However, I read this on a (rare) scorcher of a day in Ireland, and didn't feel the out-of-season vibe that a reader sometimes gets when turning the pages of a Christmas book. The season is irrelevant to the story, so don't be put off by a bit of snow or fairy lights on the streets. One of my favourite aspects of the book was that each chapter begins with a famous literary quote. Each one seems to be have lovingly chosen rather than just Googled and I recognised a lot along the way. Darcy's character was a complete book nerd, which I am too, and I felt like we could be great friends if she wasn't fictional! Her investigative skills were a bit slumped and not thought through very well, but I think this was perfect for her persona. More pen and paper than i-cloud, letter writing than e-mails. I found her work colleagues a lovely addition, a real mix of characters that gelled well, despite their different backgrounds. 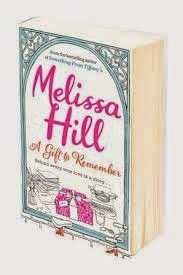 I have been a fan of Melissa Hill for many years and was delighted to see that, if anything, she is getting better and better with each book. I have added this to my Top 5 reads for summer, as not many books cause me to ignore all my daily chores and even forget to feed my children at their normal times. Maybe the sunshine helped, maybe it was pure laziness, but I think it was more that I was in Darcy's world for those three or four hours and could smell the bookstore, feel the spines of the classics and wanted to be walking down the streets of Manhattan with my dog on a lead and a Starbucks in my hand. Well done Melissa. A fantastic light read, with fab quotes and lots of book talk. But, you owe me a days housework! !